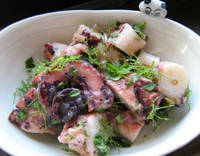 Greeks eat a lot of octopus, and a cold octopus salad is a common meze (appetizer) served with raki or ouzo, the local anise-flavored liqueurs. This is my take on the classic, which uses olive oil infused with fresh oregano as well as green olives steeped in bitter Seville orange juice. 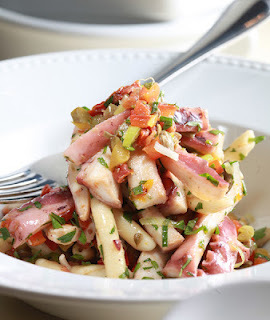 Cook the octopus. Thaw and blanch in boiling water for 1 minute. Cut off the head, then put the legs in a brazier or a shallow ovenproof pot or pan that has a lid. Add all but a few sprigs of the fennel tops, bay leaves and rosemary, then nestle the legs on top of them. 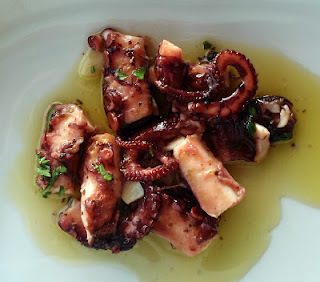 Cover the pot and bake in a 200-degree oven for up to 3 hours; you will only need 2 hours if you are using small octopi. Meanwhile, make the oregano oil. Finely chop all but a few sprigs of the oregano and place in the bowl of a food processor. Add the oil and process at high speed until it is smooth, at least 3 minutes. Scrape the sides from time to time. Drain the oil through a cheesecloth into a bottle or some other container. It will keep for a week or two. Finely chop the remaining fennel tops and the remaining oregano. When the octopus is done, let it cool, then toss it with enough of the oregano oil to coat nicely — be pretty liberal with it — then mix in the lemon juice, herbs, salt and the capers. Serve with green olives and ouzo.